Believe it or not, this was my first time ever making enchiladas. This was also my first time ever tasting mole sauce (not to mention making it from scratch). But believe me when I say, this dish is absolutely amazing! Rich, savory, bittersweet, spicy, smoky sauce covering hot cheese-filled tortillas...Mexican comfort food at its best. Best of all, the recipe is so easy! As exotic as the mole sauce tastes, don't worry, you can find all necessary ingredients at a regular supermarket. The secret to the sauce? Cocoa powder and peanut butter! To make the sauce, simply saute onions, and then add spices, diced tomatoes, water, and the two secret ingredients. The spice combination, which adds to the exotic flavors, consists of cinnamon, chili powder, ancho chile powder (cayenne can be substituted), cloves, and brown sugar. The smell of the mole as it cooks is intoxicating! 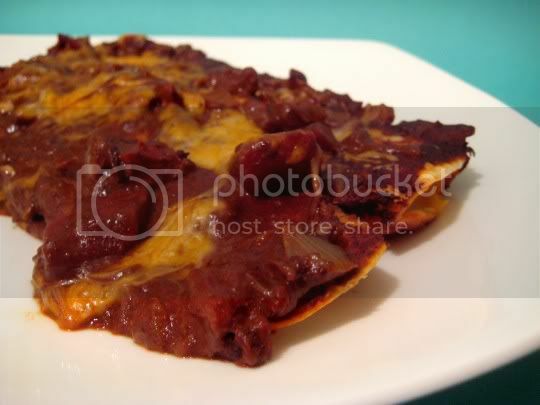 When it's done, spread some in a baking dish, add as many tortillas filled with shredded cheese as will fit, pour more mole and cheese on top, and bake until bubbly. The recipe called for flour tortillas, which I thought was odd...don't most enchilada recipes use the corn version? Regardless, the flour tortillas got soft and chewy after baking in the mole. And although the recipe called for Monterey Jack, I used a cheddar-jack blend (hey, it was on sale) that maybe worked even better, adding extra richness from the cheddar. But that sauce. It is some amazing, addictive stuff. You can taste the chocolate, which takes on a smoky flavor from the spices, and the peanut butter adds an unmistakable creaminess and robustness. You will never forget the flavors of this, as it's probably unlike anything you've ever had (unless of course, you're a mole aficianado). Please forgive my enrapturement, I'm a first timer! Make again? Hell yes. This is a definite crowd pleaser and will stun those who aren't afraid of some flavor!